The carbon dioxide (CO₂) content of the air is an indicator of the indoor air quality – assuming that human respiration constitutes the main emission source for the CO₂. Measuring instruments with CO₂ sensors enable you to reliably control this important value: because, as the air quality falls (increasing CO₂ content in the air), performance also falls. 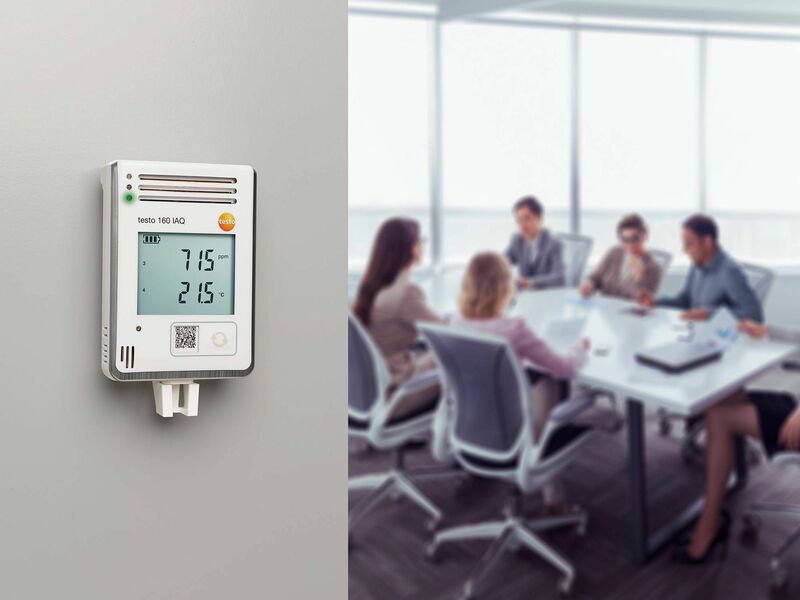 Testo Whitepaper "CO₂ monitoring and indoor air quality". If the CO₂ concentration in the air we breathe rises above 150,000 ppm, unconsciousness occurs. The CO₂ limit value in offices is 1,000 ppm. The optimum value is 400 ppm. 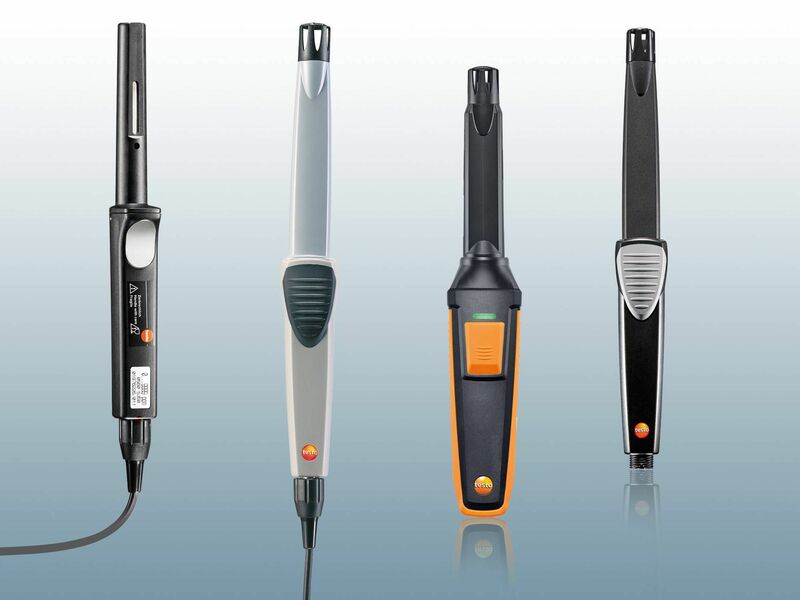 Robust, tried and tested instruments. Ideal for monitoring and optimizing indoor air. 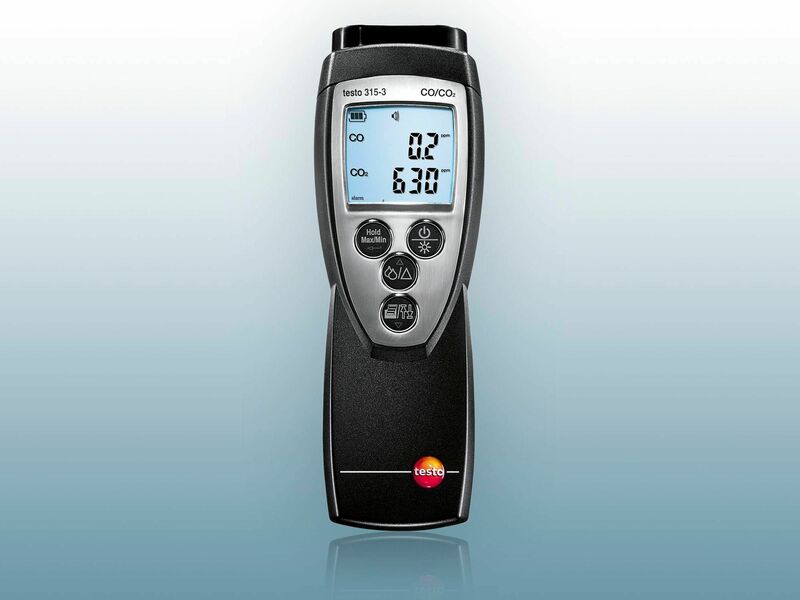 CO₂ measuring instruments with unbeatable price-performance ratio. In addition to CO₂, also measures further parameters relevant to IAQ – simply attach the required probe. The classic solution for CO₂ measurement at lightning speed. 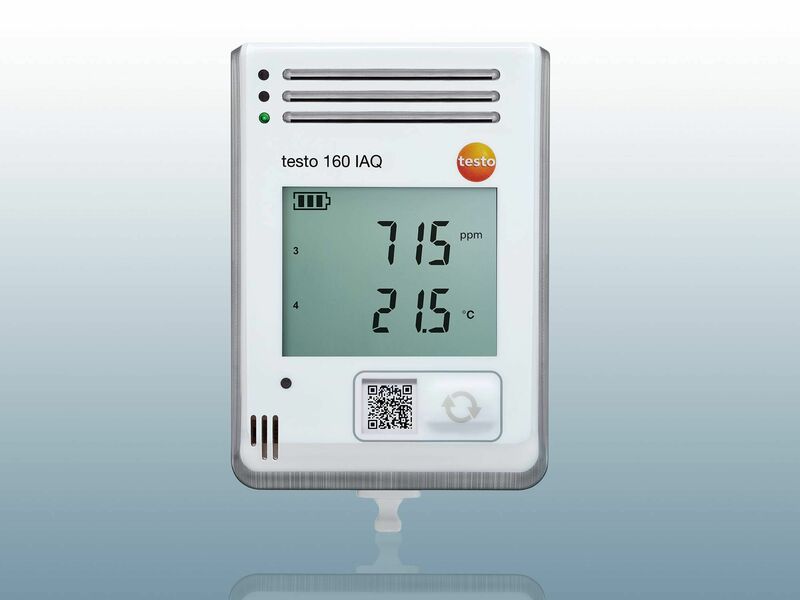 CO₂ measurement probes, IAQ probe and additional probes relating to indoor air – suitable for your Testo measuring instrument. Data logger for monitoring the indoor air quality. 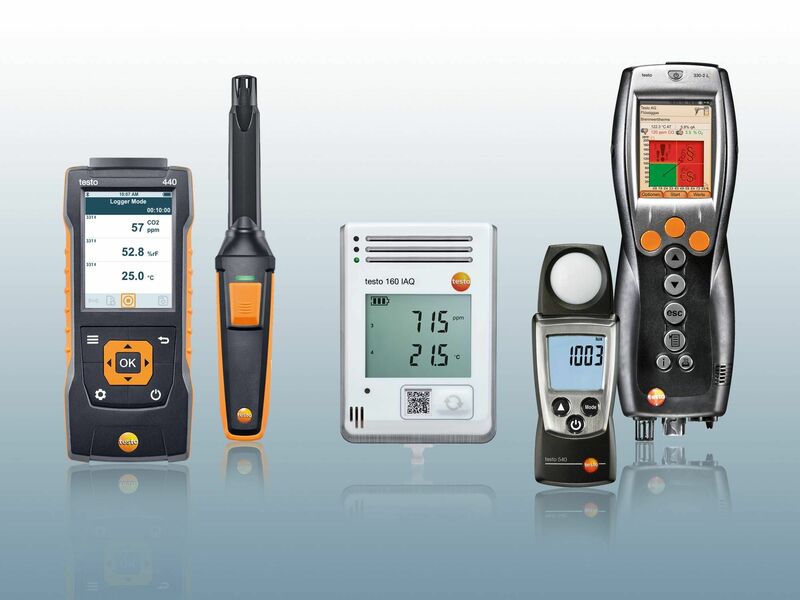 Wherever you want to measure CO₂: rely on Testo! 5 tips for efficient CO₂ measurement! Do you need a CO₂ measuring device for continuous data recording or do you tend to carry out measurements sporadically at different locations instead? 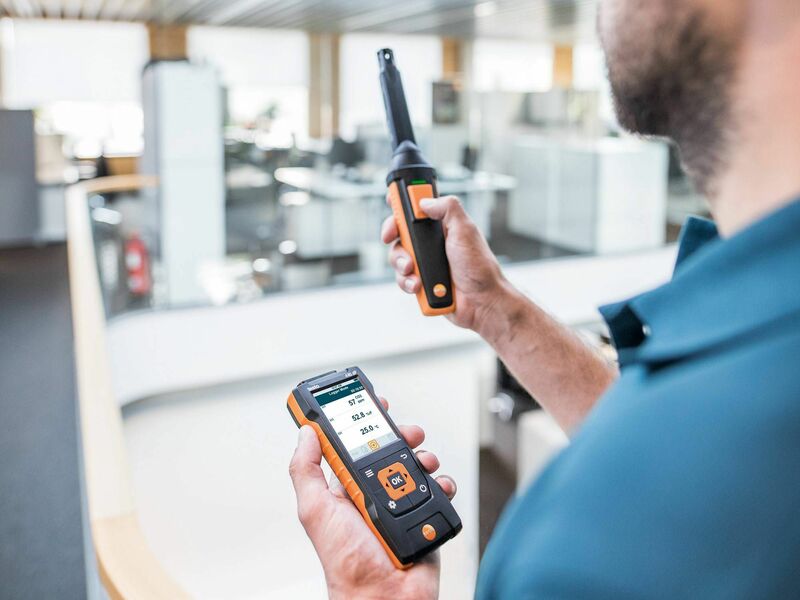 Depending on the requirement, either a stationary CO₂ data logger or a portable CO₂ or air velocity & IAQ measuring instrument, like the testo 480 is ideal for you. Both fine dust and condensation influence the optical path and therefore the measurement results. The air you breathe is saturated with CO₂ and must not flow in the direction of the probe. Simply use a stand and move a little to one side. For measurements at the workplace, determine the CO₂ value at the head height of the people working there. If there is a raised CO₂ concentration, it may be due to the ventilation system not being correctly set. A quick check is always a good idea. 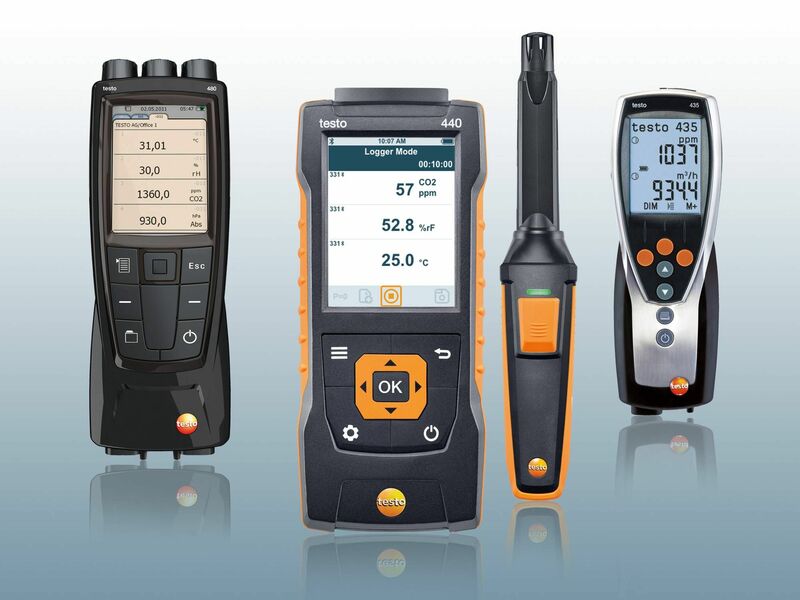 Discover more Testo measuring instruments! What would you like to measure? At Testo, you will find a measuring instrument which meets the highest demands for every VAC parameter: temperature, humidity, flow, pressure, measuring instruments for refrigeration systems, data loggers and lots more. Air velocity & IAQ measurement "all in one"
Would you like to set your ventilation and air conditioning system or control the indoor air quality? Then why not measure all the VAC parameters with just one instrument. Which one? Here, you will find the appropriate multifunction measuring instruments for your applications. Easily monitor the air quality in rooms where lots of people are present via WiFi. No matter whether the areas are open-plan offices, museums or nursery schools: a Testo IAQ data logger will give you the ideal support. Ensure an efficient heating system with high-precision flue gas analysis. These flue gas analyzers make sure you can work efficiently. You can record highly dangerous carbon monoxide as an individual parameter at lightning speed with a special CO measuring instrument. Testo provides you with the ideal set-up for controlling industrial and environmental noise. Choose the sound level meter which suits your tasks. Testo's high-precision lux meters help you to ensure optimum light conditions. Whether contactless rpm measurement via a reflective marker and light beam or contact measurement via a measuring wheel: find the best rpm measuring instrument for use in air conditioning technology or in other fields of application.